Recent research has revealed potential roles for neuroactive steroids in the pathophysiology and treatment of a number of psychiatric and neurological disorders. A wide array of preclinical investigations also reports neuroactive steroid actions in areas relevant to neuropsychiatric conditions, including neuroprotection, neuroplasticity, and neurogenesis. Levels of several neuroactive steroids are altered following the administration of various pharmacological agents, and it has been hypothesized that neuroactive steroid induction may contribute to the efficacy of selective serotonin reuptake inhibitors (SSRIs), atypical antipsychotics (also known as second-generation antipsychotics), and mood stabilizers. In addition, neuroactive steroids may have potential as agents for pharmacological intervention. The following chapter will focus primarily on changes in the neuroactive steroids allopregnanolone and pregnenolone in response to the administration of several classes of commonly prescribed psychiatric medications, although alterations in other neuroactive steroids will also be included. In some instances when appropriate, evidence of alterations in baseline neuroactive steroid levels in psychiatric disorders will be discussed for a more complete picture of clinically relevant findings. 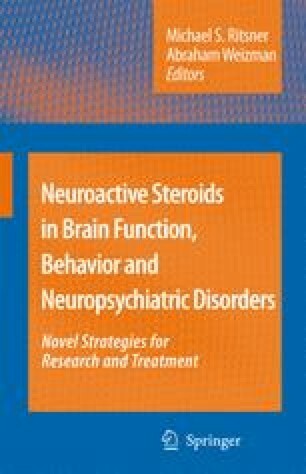 Given the multifaceted actions of neuroactive steroids in rodent models, including neuroprotective effects against a number of stressors, modulation of the hypothalamic–pituitary–adrenal (HPA) axis, enhancement of neurogenesis and myelination, and anti-inflammatory effects, it is perhaps not surprising that neuroactive steroids have been linked to clinically disparate psychiatric and neurological disorders that may be impacted by these diverse effects. The modulatory actions of neuroactive steroids at GABAergic and glutamatergic neurotransmitter systems, which constitute the major inhibitory and excitatory neurotransmitter systems in the mammalian brain, respectively, are also consistent with the relevance of neuroactive steroids to multiple neuropsychiatric conditions.